The DFG-RS3 is an economical digital force and torque indicator that works with a wide variety of plug and play force and torque sensors. All calibration and configuration data is stored in the sensors smart connector instead of the indicator making the sensors truly interchangeable. In addition all of the remote sensors are also fully compatible with the advanced DFG-RS5 force/torque indicators. A variety of interchangeable force and torque sensors are available for use with the RS3 series. Sensors are available in a range of capacities from 0.25 to 10,000 pounds force for load cells and 10 oz-in to 100 lb-in for torque sensors. 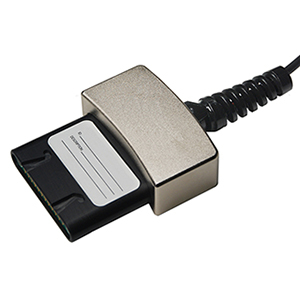 In addition to the pre-calibrated sensors the DFG-RSA programmable adapter allows the end user to calibrate most bridge type force or torque sensor with a 1 to 3 mV/V full scale output to work with the DFG-RS3. The RS3 series also shares menu structure and most specifications with the DFG35/HHTQ35 force and torques gauges. A backlit graphic LCD displays large characters and a menu is available to access the gauges features and configurable parameters. Units also have a USB output for data collection and setpoint indicators for pass-fail testing. Chuck Opening: RTQ50-10Z and RTQ50-50Z – 0.062 to 0.375" RTQ50-12, RTQ50-100 – 0.078 to 0.5"
Nota: Comes complete with carrying case, universal voltage power adaptor, quick start guide, users manual and certificate of conformance. All RLC or RTQ sensors come with a NIST traceable calibration certificate. * Remote sensors sold separately.